Mother says that I am the Bell Horse. Apparently, Mother has dreams of a donkey pack train. 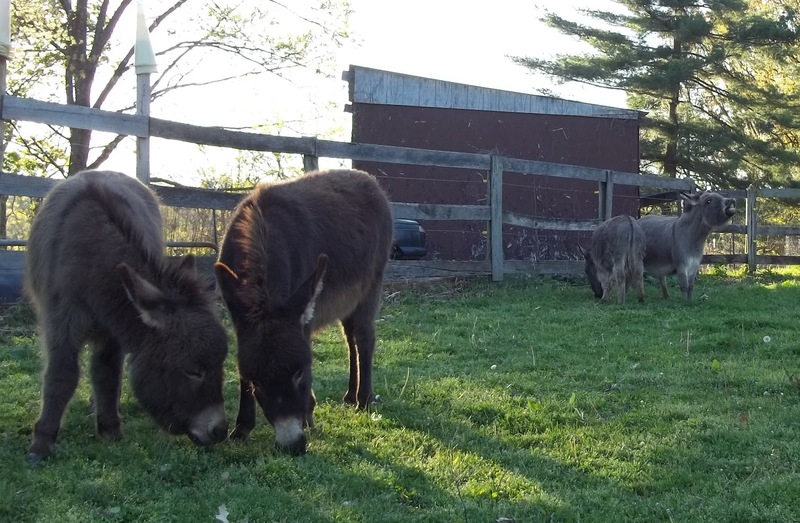 Not actual donkeys in question. These are from the Queen Valley Mule Ranch in Arizona. Mother says the Bell Horse carries no pack or rider, merely a bell, as he leads the train. He is traditionally white. Auntie Julie and her human larvae came to visit tonight with Mother and Aunt Erin. 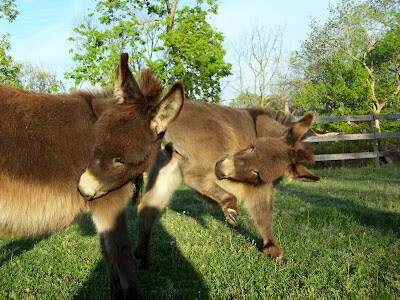 They oohed and ahhed over fat donkey and the others, then came and oohed and awed at me. They had a bag of carrots. Mother had to teach me about carrots. The first time someone tried to feed me a carrot, the chiropractor, he ended up using Mrs. Pastures Cookies to get me to do my stretches. And the first time someone tried to feed me an apple, Mother had to eat a few slices before I realized I was expected to eat that. I've come to appreciate both carrots and apples, along with various baked and pressed goods. Sometimes carrots just look like fingers. 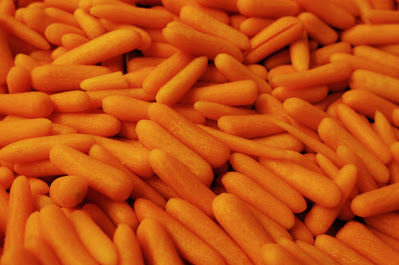 I stared at the conglomeration, not sure where the carrot was with his little larvae fingers there. Finally, I put my nose on his hand, he squealed, Mother grabbed the rolling carrot and I picked it up with my lips and ate it. It is so hard to be a good host. So, Uncle Jeff came up today. About three minutes before Mother heard the truck, I heard it and started dancing around in excitement. It's a sound I know well from my stays at Uncle Jeff's while my face was worked on, and I knew what it meant: I was going to my Happy Place. Yet again, Mother was too engrossed in the proceedings to take photos. Well, of me, anyway. She did end up taking some pictures of my fat donkey. That's because my fat donkey was sent to his Happy Place as well. Unlike my enjoyment of the Happy Place... well, unfortunately for donkey, a few hours later he had a bit of a bad trip. Donkey started shivering, muscles a-tremble. 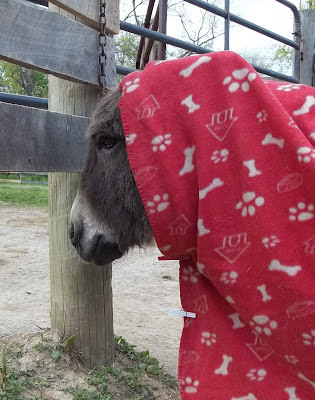 A quick call to the vet and a relaying of symptoms seemed to confirm that my fat donkey was having trouble thermoregulating and was very cold. His ears (and other junk) were quite icy. 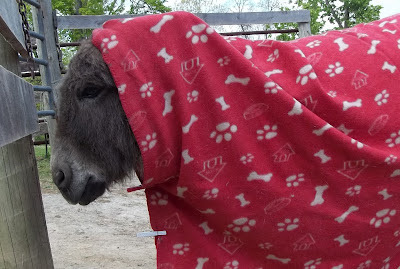 In an attempt to help warm him, one of the aunts brought up a blanket. Druid Donkey is NOT happy. *Not to disparage, stereotype, or otherwise degrade any human or their wardrobe choices. Mother has all sorts of things occupying her thoughts. Apparently there is a holy-day today, and of course there is the Assimilation program going on, and even the horse she doesn't have any more seems to be getting more attention than me. Ohh, ohhhh, OHHH!!! 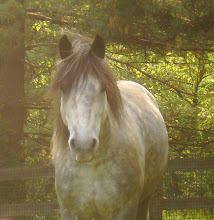 And, when she does pay attention to me, she says I look like a halter horse gone wrong, or maybe a pig. Mother, there must be something wrong with your camera settings; the weight tape still has me under 950 pounds. 1) Pay attention to ME! 2) Give me cookies. I am not fat. 3) Please check your camera settings or get me a new one. That is just embarrassing. You're wondering what I am staring at? I am not sure I can put it into words.